Ossett is a town of approximately 22,000 people in West Yorkshire. It used to be a ‘Shoddy’ town, in that it made shoddy, a type of low quality woollen cloth from the recycling of rags and wool. In the late 19th and early 20th century Ossett was a relatively prosperous industrial town, and its fine municipal buildings indicate that like its neighbours Batley and Dewsbury, Ossett did very well from the recycling of wool. Modern day Ossett looks like a lot of other northern towns, it prides itself on having many independent shops, several thriving church communities, excellent schools and despite losing its railway station in 1964, it’s well connected to the outside world via the M1 and M62 motorways. We think we’ll be waiting a while for Ossett Airport. 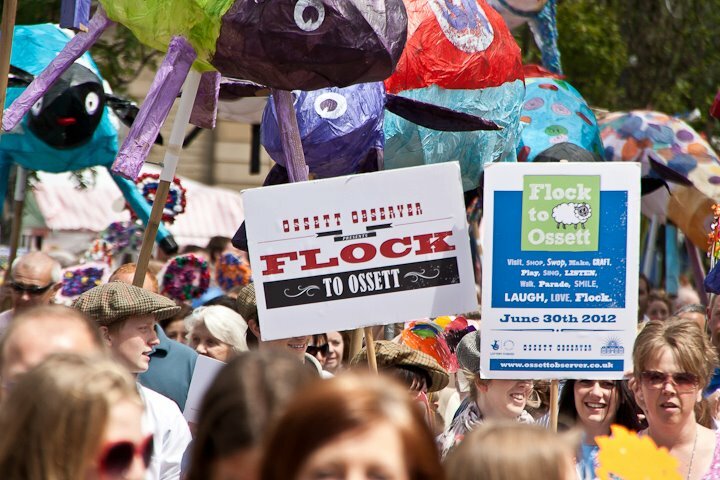 Ossett people are a resourceful and hardworking lot who generally share an old fashioned sense of pride in where they come from. The unofficial motto of the town is ‘Inutile Utile Ex Arte’ which means ‘That Which is Useless Made Useful Through Skill’. When we were looking to start Ossett Observer Presents, this motto of applied skill, crafts and resourcefulness became our motto. We hope that wherever we are applying our skills and labour that we are being both resourceful and useful. We are artists and creative consultants.